Facebook and Microsoft are joining the growing ranks of leading high-tech industry players aiming to expand sustainable energy access and renewable energy microgrid deployment across the developing world. Partnering with clean energy venture capital specialists at Allotrope Partners, the companies aim to raise $50 million from 2018-2020 to fund projects that expand energy access in East Africa, India and Indonesia, Bloomberg News reports. Dubbed the Microgrid Investment Accelerator, the sustainable energy investment facility’s three project partners will look to grants and loans from foundations and development banks for capital and leverage to raise additional project funding from private sector investors. It wasn’t disclosed how much, if any, of their own capital, they are plowing into the investment facility. Facebook, Microsoft and Allotrope join a growing roster of prominent corporate names seeking to capitalize on a boom in deployment of basic off-grid solar home systems, services and energy efficient products. The trend first took root and bloomed in East and Sub-Saharan Africa. Fueled by the declining cost of solar PV and battery storage, the application of appropriately crafted, innovative business models and application of mobile network and payments, off-grid solar market growth and expansion is opening up new opportunities to network solar home energy systems and possibly add more efficent, larger scale battery-based energy storage and management systems (BESS) to create community microgrids. For example, pioneering renewable energy micro-utiliy Sigora International aims to expand the customer base of its pilot, 5,000-member community microgrid in northwest Haiti to 136,000 (27,000 accounts). Sigora Haiti was the first to be awarded funding from the EU’s ElectriFi clean energy access development fund in February. Sigora Haiti will use proceeds from ElectriFi’s $2.5 million investment to raise power generation capacity of its pioneering renewable energy-fueled micro-utility platform to 3.5-MW-peak (MWp). Just yesterday, the African Development Bank (AfDB) approved a US$2.3 million project preparation grant that should pave the way for future off-grid solar energy investments in rural and urban areas in Uganda. 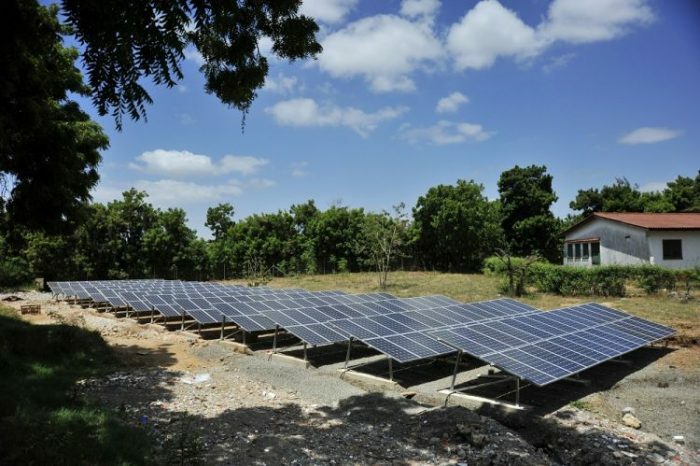 More specfically, the Climate Investment Funds’ Scaling-Up Renewable Energy Program grant will be used to prepare feasibility studies, help establish and obtain required regulatory and legal approvals needed to finance off-grid solar projects for residents living on islands in Lake Victoria, according to AfDB. “The proposed electrification program on the islands in Lake Victoria will considerably boost economic and social development and improve the lives of the most vulnerable ones especially the women and youth,” Amadou Hott, AfDB’s vice president for Power, Energy, Climate Change and Green Growth was quoted in a news report. In 2014, Microsoft co-founder Paul G. Allen’s Vulcan Impact Investing team and remote monitoring company steama.co launched an initiative that has resulted in the commissioning of 10 solar powered mini-grids that provide emissions-free electricity to rural Kenyans. For its part, “MIA will test the commercial opportunity for microgrids and demonstrate how concessionary finance can unlock progressively larger proportions of private capital as risks are discovered, priced, and mitigated,” CEO Alexia Kelly was quoted in the Bloomberg News report. “The Microgrid Investment Accelerator will not only be a powerful tool in driving much-needed capital into projects, but will also help to bring down costs, build a stronger ecosystem, and catalyze innovation,” added Microsoft’s Kevin Connolly, director of affordable energy access initiatives. MIA has signed up more than a dozen implementing partners and observers thus far. Plans are to open up a pilot project proposal process in 3Q with funds disbursement slated to begin in 2018. Brightfarms builds local hydroponic greenhouse farming systems that produce competitively priced fresh produce for supermarkets while avoiding the environmental costs of industrial farming and transport logisitcs. GlassPoint Solar develops low-cost concentrated solar thermal installations for enhanced oil recovery, with its first commercial installations operating in Oman and California. Lucid Design is an energy efficiency software company, offering a user-friendly “dashboard” and middleware that integrates multiple building management systems to a single platform – BuildingOS – for commercial buildings and campuses. Natel Energy is developing a low-head hydropower turbine enabling cost-effective production of low impact, distributed base-load energy from existing low dams, irrigation canals and other low-head hydro resources. Terviva is commercializing proprietary varieties of the Pongamia tree, an oil-seed plant that can grow in sub-optimal agricultural land while using less water and fertilizer than other crops. Pongamia seed oil is ideal for biofuel production and the seed cake can be used as animal feed, potentially creating attractive economics for both farmers and land owners. V4 Advisors is a Dubai-based technology company offering online platforms to monitor, audit, and share environmental data, focusing on resource-intensive Middle Eastern markets. The V4A reporting platform is the first in any emerging market to have been certified under the GHG Protocol of the World Resources Institute and the World Business Council for Sustainable Development.